"Spirit of the Living God, fall afresh on me. Melt me, mold me, fill me, use me." As United Methodists, most of us have sung these words in worship, asking God to prepare us for His service. As United Methodists, it is our fervent prayer to be the hands of God in our community. But, being a disciple and doing God’s work in the world is hard work. It takes a lot of time, and it takes a lot of energy. The fact is, it is rarely convenient to help others. That is why Impact Sunday is so important to me. Rethinking church on that one day each year, and participating in pre-arranged projects, creates one of those rarely convenient opportunities to love our neighbors. Planning this year's event was especially gratifying to me because it brought together the other churches of the East County United Methodist Mission Area. Since we began this event three years ago, Foothills has been looked to as a model for how to do Impact Sunday well. We have a lot of expertise to offer the other UM congregations, and I was so proud of all of you as I shared our success stories with the team. Thank you for wholeheartedly joining me in service. 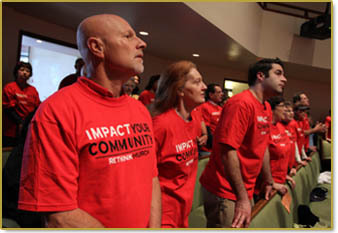 As we expand the reach of Impact Sunday, I am excited about the possibilities. What if a time came that when people heard the words "United Methodists," they would immediately think, "those are people who serve?" Is that too big of a dream? Last week I received an email from Marilyn at First Lutheran Church in El Cajon. She had seen our banner in front of the church, and wrote to let me know she would be praying for us on May 20th. Her church held a similar event the same day called "Love El Cajon." We will get together soon to meet for the first time and compare notes. Marilyn's message made me realize that my dream is actually too small. Instead I want to ask this: What if a time came that when people heard the word "Christians," they would automatically think, "those are people who serve?" I am convinced that with God's help that dream can come true. Spirit of the Living God, fall afresh on us.